Malicious Anti-Virus scams also known as rogue AV involve users being tricked in to downloading or paying for antivirus software that is actually completely fake malicious software. This issue is growing; according to the latest research by GetSafeOnline.org (the UK’s national internet security initiative) a rising number of organised criminal gangs are tricking security-conscious internet-users into purchasing fake anti-virus software to access their bank details. • They trick you in to paying them money to upgrade to the full package which will actually remove the software. • Once the malicious software is installed they can access your computer to steal valuable information such as passwords and online banking details. Fake Help Desk Calls: Organised crime rings have been discovered posing as legitimate IT companies to call people and convince them that they have a virus on their computer and they can help you remove it. Users are then conned into purchasing and installing what is purported to be an antivirus utility. Popups or websites carrying out a free scan and informing you that you’re infected: These popup and look as though they are scanning you system when in fact they are doing absolutely nothing. They then tell you that you’re infected and you need to download their antivirus utility to remove the threats. Unsolicited emails: Another way that they infect people is by sending emails offering a free scan of your computer or that someone has reported to them that you have a virus on your system and they can remove it. What does the software look like when installed? The software can completely fake the interface of some of the genuine AV software on the market to try and trick you in to it being genuine or try and lead you to believe that it is you antivirus software. 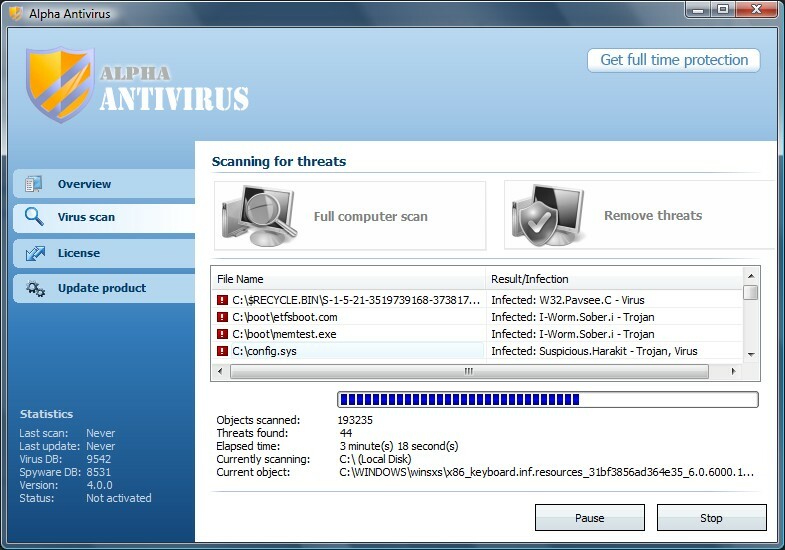 It will often scan your computer very quickly and we all know that a genuine antivirus scan takes some time. After a quick 30 second scan it claims that you have an unbelievable amount of threats. How can I protect myself from these types of scam? • Make sure you have an Antivirus package on your computer, that as either been recommended to you by someone you trust or you have thoroughly researched yourself. • Ignore any unsolicited calls or emails from companies offering free software checks on your computer. Genuine IT companies will not contact you directly in this way without prior notice or a direct request and will never say over the phone that you’re infected without actually seeing your computer. • Be wary of any pops on the internet telling you that you are infected or that they are scanning your computer. The best thing to do is to close these popups and exit completely out of the website. Previous PostHow important it is to update your computers softwareNext PostWhich Internet Browser to Choose?